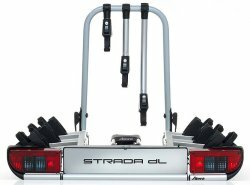 Atera Strada DL 3 to 4 bike carriers are the best designed and best engineered tow bar carriers on the market. This rack slides away from the vehicle rather than tilting so the bike rack takes the weight of the bikes rather than you and allowing access to the rear of the vehicle. This is by far the easiest tilting carrier to use. It can be hired with our Ford Tourneo. Hire charge allows for hires up to three days, thereafter an additional charge of £10.00 per day inc vat.